The members of Heritage Presbyterian church are known throughout this Presbytery for their generosity. They give of their time and their money, to local and more distant mission projects. St. Paul’s Wednesday Night Community Dinner: On the third Wednesday of each month, members of our church plan, prepare, and serve dinner to everyone, who comes to St. Paul’s Episcopal Church that evening, seeking a hot meal. The meal is free. After serving the meal, our members clean up the kitchen leaving St. Paul’s kitchen and hall in the same or better condition than when we arrived. 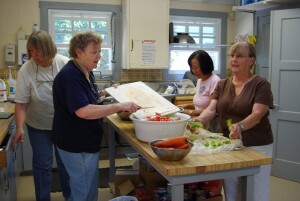 An average of fifteen volunteers participates in this ministry. Select members of our congregation have been trained in safe food handling. Designated members are authorized to go to the Food Bank and select food, which supports the planned menu. Other food is also selected and made available to those in need. We rely on individual donations, the food received from the local Food Bank, and a grant from the Presbytery of the Redwoods Hunger Task Force to expand our ministry beyond what our budget supports. Fair Trade Coffee: The Fair Trade Coffee program has been set up to ensure farmers earn a fair wage. One member of our church has taken on the responsibility for maintaining the inventory of Fair Trade Coffee and related items. Coffee, tea, olive oil, and chocolates are available for purchase every Sunday. For more information about how the fair trade mission project helps ensure small farmers around the globe earn a living wage, visit equalexchange.coop/fair-trade. 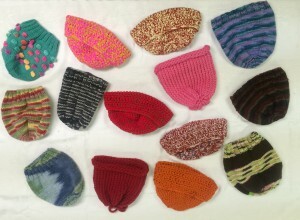 Cancer Caps: Several women of the church enjoy knitting. They have begun making caps for people undergoing chemo-therapy. The caps are collected and delivered to local hospitals. Recently, we delivered over 160 caps. SafeQuest: SafeQuest is a safe haven for victims of domestic violence, who were forced to leave their homes immediately with little or no preparation or supplies. We encourage our members to collect unused toiletries from their hotel stays. We bag the toiletries into packages, which can be given to a single person, and provide those packages to the SafeQuest distribution center in Fairfield. We also have various campaigns during the year, collecting paper goods, kitchen supplies, or sweat clothes for those who seek shelter at SafeQuest. Food Barrel: We maintain a barrel in Heritage Hall, where our members and others using the hall donate non-perishable food items, which are collected regularly and delivered to the Food Bank of Contra Costa and Solano.